OK, here’s the deal! Not only do we have incredibly awesome bike rental options, we equip them with EVERYTHING you need to make the trip! If that doesn’t blow your mind….you can ride them one-way and drop them off at the conclusion of your trip! BOOM! Mind blown and logistical problem solved. Scroll through this page to put it all together. 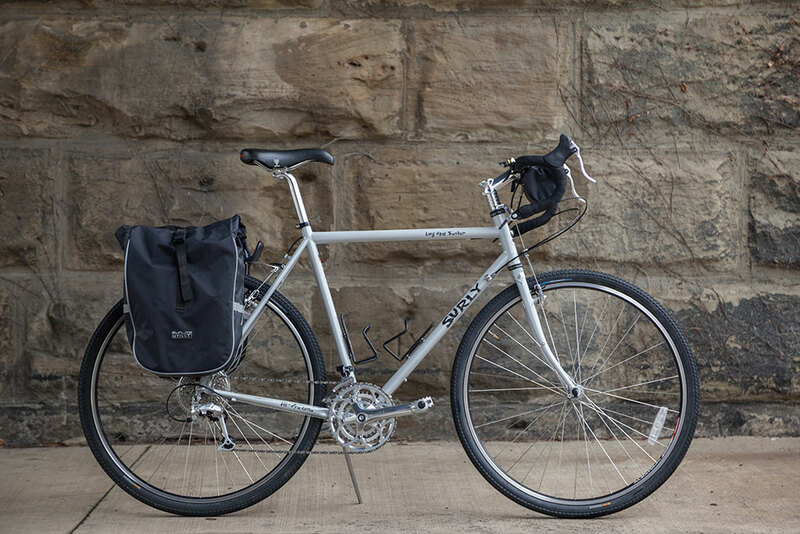 Our Bikes are “Fully-Equipped” and include EVERYTHING you need: Rear rack, Panniers, Tools, Tubes, Helmet, Lock, Handlebar Bag, Headlight, Patch Kit, Tire Levers, Pump, and a Professional Fitting that is second-to-none…making absolutely sure that you are comfortable and ready to roll! Up to 20% off of the following prices when you combine your bike rental with additional services. Check out our TRIP PACKAGES to start saving. The right balance of comfort, stability and trail capability. 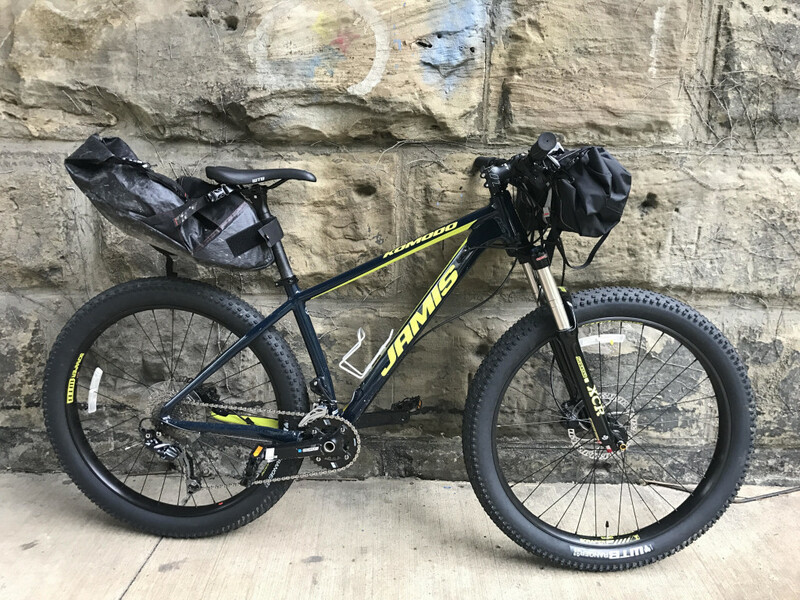 A great bike for the unique terrain of both the Great Allegheny Passage and C&O Towpath in the Fuji Traverse. 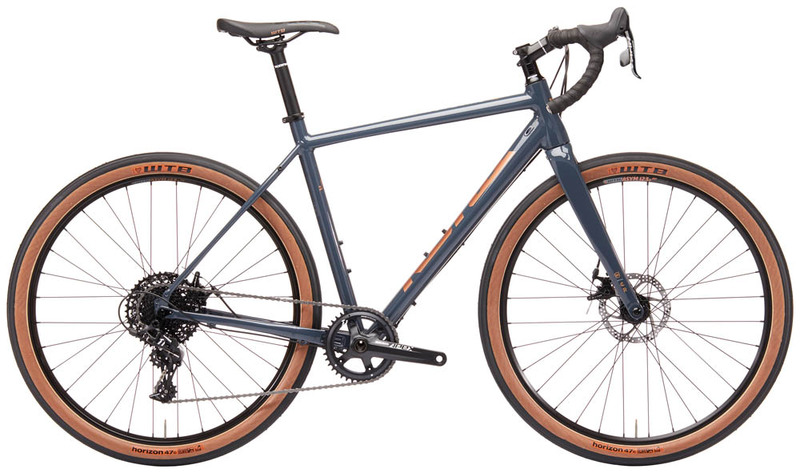 We can set this baby up to fit your riding preferences and needs. From relaxed to aggressive, this bike does it all! Fully-Equipped with everything you need for the ride….see list above. 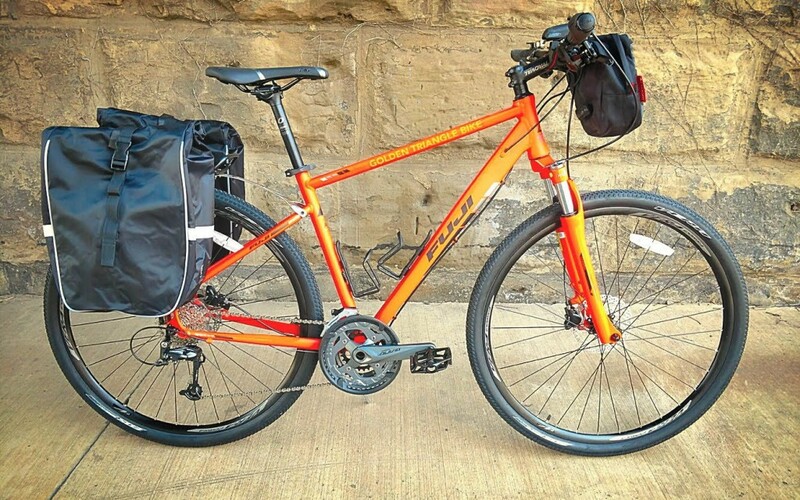 Our touring bikes can handle the load and are recommended for those riders that are used to drop handlebars or are carrying extra weight (camping gear, tents, stoves, the kitchen sink). Fully-Equipped with everything you need….see list above. 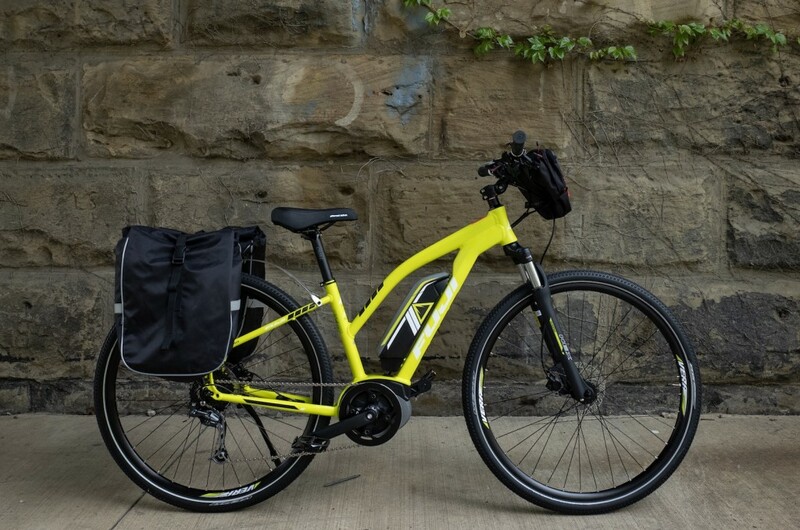 Pedal assist bike that gets 40-60 miles in Eco and Touring Mode. Two is better than one. 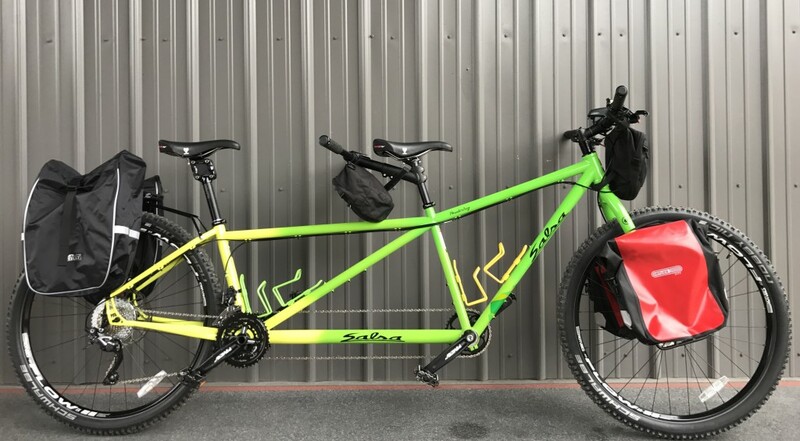 Experience the trail on one of our awesome Tandems. The perfect balance of touring capability and performance, the Salsa Powderkeg is second to none. Crush the miles and the mixed surfaces of the trail! Want to ride your bike one-way and drop it off in Cumberland or DC, hassle-free?….No problemo. Add the charges below to the above rental fees and you’ve got yourself a Fully-Equipped-One-Way-Bike-Rental-Extraveganza! Our bike drop off locations are super-conveniently located at L’Enfant Plaza in DC and in Canal Place in Cumberland. The DC drop off is about 1.5 miles from the mile 0 of the towpath. The Cumberland drop off is directly on the trail at Mile 0 of the Great Allegheny Passage! We also have a wide variety of extra equipment that, while not necessary to complete you journey, can add to your comfort and experience! All of these rentals are available as an add-on to your fully-equipped bike rental package. Ask about pricing and availability at the time of reservation. Add-ons include: taillights, trunk bags, smartphone mounts, computers, mirrors, bar ends, CO 2, auto racks, BOB Trailers and more!